We admit we are huge fans of cooking classes. Also, we have had our fair share of experiences with them so far as well. For us, joining a cooking class is one of the best activities to learn more about the culture of the country we’re in. This time, in Hoi An, we were invited by the Sabirama Cooking School to do their Hoi An cooking class tour. While most cooking classes in Hoi An only focus on the actual cooking and maybe a market tour, this was something more special. But let me start from the beginning. We were picked up by our guide Nhu in the morning at 8 am to drive a short distance to our starting point: The market. The market is undoubtedly the busiest and probably one of the most interesting parts of Hoi An. You can see the fresh fish that was caught early in the morning, colourful fruit and vegetables and spices and herbs which might soon be in your breakfast, lunch or dinner. Nhu showed and explained us different ingredients and also introduced us to various delicious coconut snacks. One of the favourite foods she showed us though, was definitely the dried and sweetened ginger flakes. After the short visit to the market, we continued to the next part of our Hoi An cooking class experience. A bit further up the market was already our next transport waiting for us. We hopped into a colourful boat and started our trip to the next destination. The whole boat trip took about 40 minutes an there was a lovely wind refreshing us during the ride. Nhu showed us some sights, like bridges and the famous and impressive fishing nets. To see these beautiful nets from so close was one of the highlights of our boat trip. At least until Nhu asked us, whether we want to steer the boat for a while. I tell you, steering a boat is at least as cool as it sounds. For about 10 minutes I navigated us safely through the Thu Bồn River. It was a great feeling to manoeuvre us through the fishing nets and under the impressively large Cầu Cửa Đại bridge. This is definitely not your typical Hoi An cooking class experience. Once we arrived in the commune of Cam Thanh, we changed again our mode of transport. This time we transferred to one of those cute basket boats, or Thung Chai, how they’re called in Vietnamese. These boats were once created by the clever Vietnamese to evade the heavy taxes the French raised on the ownership of boats during the French colonial era. The fishermen who built those boats argued, that they are not boats but baskets and that they, therefore, don’t have to pay any taxes on them. A bit earlier this week I also met an 85-year-old man who builds those Thung Chais since he was 15. He explained to me, that he on average needs 10-14 days to build one of those boats. I was highly impressed with his work! During the short boat ride, where I also laid my hand on one of the paddles, I learned how difficult it is to navigate this nutshell boat. If you don’t do it in the right way you just turn around in circles. This might sound like a lot of fun, but it doesn’t bring you anywhere. A short time later we boarded our last mode of transport for this trip, a water buffalo-drawn carriage, which brought us in only 5 minutes to our final destination, the Sabirama cooking school in Hoi An. As soon as we arrived, we were welcomed with a delicious fruit juice and a very relaxing shoulder and foot massage. There was even the option to get a pedicure and painted toe-nails for a small fee. While Sarah decided to have the pedicure, I walked a bit around and took pictures of the pretty place they set up. Especially the little lounge in the middle of a pretty pond looked very inviting. After this, we started with the actual cooking part of our Hoi An cooking class. On the menu were four different dishes: Mango salad with seafood (gỏi xoài), Fresh rice paper spring rolls (gỏi cuốn), Vietnamese pancakes (bánh xèo) and sautéed chicken with lemongrass and chilli. We started with preparing the mango salad. The mango salad itself was very fresh and delicious. The shrimps and squid we added to it gave it a bit more consistency. After preparing the salat, Nhu also showed us some simple, yet beautiful tricks for decoration. We made a tomato rose, cucumber plants and cucumber butterflies. The second course, the spring rolls, was our favourite meal and my personal highlight of the whole Vietnamese cooking class. Instead of just taking ready-made rice paper sheets, we made them completely ourselves. The process of creating them is actually quite simple and doesn’t need many ingredients, yet they taste so unbelievably delicious! By now, the owner of the Sabirama cooking class Hoi An came to greet us and we had a short chat with him. He told us, that he wanted to create with Sabirama more than a cooking class. While the cooking is the main activity, he also wanted to give his guests the opportunity to experience other great things in Hoi An. Especially because a lot of people don’t stay that long in Hoi An and not always have the time to do so many different things. We think that this is a great way to organise a cooking school experience in Hoi An and enjoyed it a lot. After this short chat, we went back to our cooking stations to prepare the last two dishes, which we then enjoyed together at the table. Especially the sautéed chicken with lemongrass and chilli was very delicious. Our verdict of the Sabirama cooking tour Hoi An is excellent. We loved that you don’t only learn some really yummy recipes (especially the fresh rice paper spring rolls), but have a whole memorable experience in the Vietnamese countryside. The staff was always very friendly and patient and everything was organised very well. 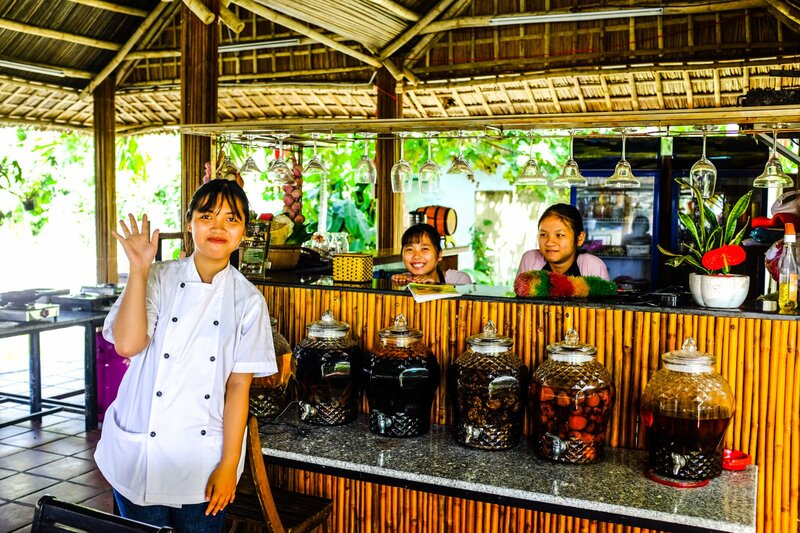 We can totally recommend this cooking school in Hoi An if you’re interested in a great cooking experience with added highlights like a boat ride in a basket boat. You can book their cooking class directly on the Sabirama homepage. P.S. : Mr Quy, the owner of the Sabirama Cooking Class, also owns a very nice Tailor Shop in Hoi An. We had a shirt and a dress made there and can vouch for the good quality of the work. Best Travel Gadgets for Backpackers – 15 Gadgets You Need to Have!